The sectional door has everything for the modern, traditional or even period style home. Take most options available for a particular garage door size and then examine your package options and nearly every time the sectional garage door will offer the best value for money against other doors by far. Why Buy A Sectional Garage Door? Or because you want choice? 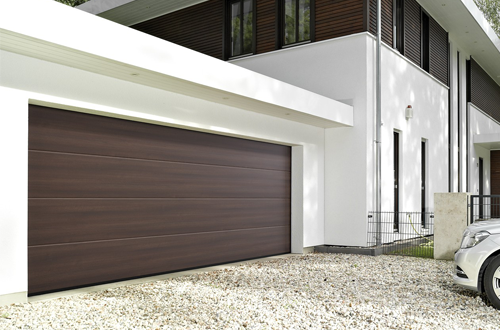 With sectional garage doors, there are so many features that are down to your own choice depending on what you need, including in styles, finishes, materials, colours, insulating properties, glazing and designer elements. 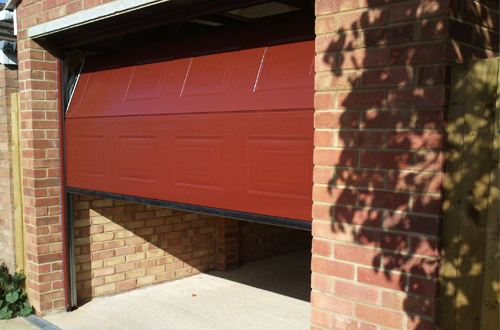 What are sectional garage doors made of? Hormann produce sectional panels in Nordic Pine, Hemlock and steel with a variation of coatings and finishes available. Garador offer steel sectional doors (which incidentally are made by Hormann and are exactly the same as Hormann). Carteck offer sectional doors up to 8 metres wide!! They also use a unique soringing operation method meaning minimal internal headroom is requred for installation. Wessex offer the glorious Vienna sectional door – lovely design with all the desirable low maintenance properties of GRP. Rundum Meir manufactures sectional doors (both side opening sectionals and overhead sectionals in the timber of the customer’s own choice. Hemlock, Larch or Oak being some of the most popular. Essentially which material you opt for is down to personal choice – however if you live in a coastal area do remember that salt will attack timber so it is probably wisest to select a steel option. Novoferm and Carteck manufacture high quality steel and timber sectional doors with differing spring operation mechanisms offering excellent solutions to low headroom situations or even major obstructions inside garages. Novoferm have the very unique Novoport electric operator system - an electric operator without a long boom down the centre of the garage. The diversity of styles for sectional garage doors is truly unmatched. Traditional to ultra modern with plenty in-between! 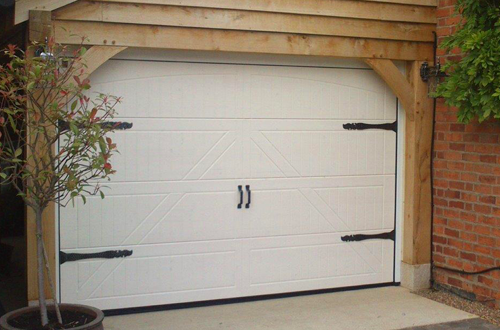 Sectional garage doors with an appearance that replicates side hinged barn doors. Georgian panelled doors to compliment period properties. There are so many designs and styles available for sectional doors - minimalist wide ribbed panel doors with smooth finishes, or designer doors with eye-catching stainless steel detail, styled for compatibility with modern modern dwelling. You are even able to design your own sectional timber doors, or patterns for Ryterna's steel sectional doors. Without a doubt, you will find a sectional door to suit your property perfectly. Lots of options. Hormann alone offer 16 factory colours and a further 200 plus RAL colours. You may prefer a wood effect that really does faithfully replicate the appearance of authentic timber. Several manufactures including Hormann and Carteck produce a foil-laminated panel. Reassuringly, the laminate is extremely tough and durable and will last for many years without any deterioration, retaining the pristine timber appearance far longer than the natural product would without treatment! Sectional doors offer some fantastic insulating options. Hormann and Garador offer 20mm and 42mm options and also a single skin (non-insulated) door. If you have an integral garage or you use your garage for other purposes such as a gym, office or workshop, you really will benefit from the insulated options. The reduction of heat loss is actually quite tangible. Of course the very large garages will benefit enormously from a controlled temperature. Car and motorbike collectors should also be looking very closely at the sectional door for the same reasons. So, Who Make Sectional Garage Doors? There are quite a few manufacturer options when considering sectional garage doors. Hormann are probably the most prolific producers. Other manufacturers include Carteck, Rundum Meir, Seceuroglide and Cedar Doors. We do offer the Garador sectional door range but they are in fact the Hormann sectional doors with a different handle badge and more limited options. Apart from bestowing an awful lot of choice the sectional garage door provides many other benefits. The vertical rising action means that there is no ‘swing-out’ enabling vehicles to be parked right up to the door. Certainly very useful when the driveway is a little limited. An extremely beneficial feature is the maximising of drive-through height and width. You can utilise the total width of your garage and virtually the total height with most standard sectional doors (dependent upon the gear). 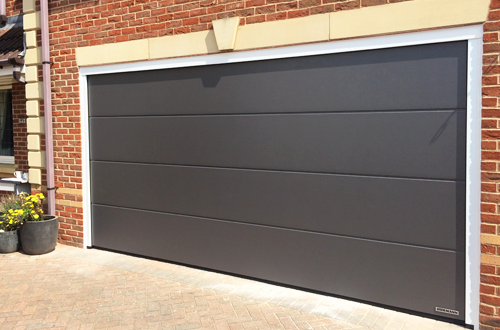 The sectional garage door is one of the most secure garage doors on the UK market today. Why? Probably the most relevant factor is the lack of penetration points when the door is fitted behind the garage opening. There is, quite simply nowhere to gain a pivot point to prise the door open. The rollers are encased in the guide tracks. There is no visible vulnerable point at all. Different manufacturers will use varying locking systems but the lack of penetration points remains the same. It really is worth making sure that the door is fitted behind the opening if possible but they are still a very secure option if installed inbetween. The combination of any sectional garage door with a high quality remote control electric operator will make a very secure door package especially if using the Hormann Supramatic or Promatic Series 3 Bi Secur openers with their patented steel hook lock built into the towing arm mechanism for additional holding force when closed, all standard features. 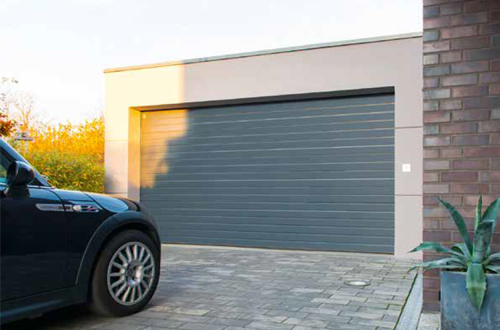 Sectional garage doors are available from all manufacturers in a wide range of standard sizes generally up to 5500mm wide and also 3000mm high. However, with uprated operating gear it is possible to achieve widths of 7000mm and again with more limited door panel designs heights of up to 5000mm. At all these sizes there is no comprimise with stability as we have found in many oversized steel, GRP and timber up and over doors over the years, the weight is spread evenly and the door panels are very strong in the 42 and 45mm specifications. If you need a very big garage door the sectional door certainly delivers with no comprimise in strength, security and operation. Surprisingly many of the standard size steel sectional doors will compare very favourably against any up and over garage doors and some of the double width sizes we have found to be even lower priced than equivalent sized up and over doors!! When you compare what you get with a sectional door it is little surprise that there are very few double up and over doors are sold in the UK nowadays. They also compare very favourably against equivalent sized insulated roller doors and quite often we are estimating for both options with very little price difference, the sectional door under close scrutiny however has the edge on specification nearly every time. The sectional garage door offers everything you would want from any door and as new colours, finishes, window options, designs and any size options are offered you would have to have a very good reason not to choose this door for your home. Look at the Hormann, Carteck and Seceuroglide doors for unrivalled options, highest quality and the best pricing. These are all very experienced and established manufacturers with excellent warranties and superb products. The Garage Door Centre has supplied and installed these doors from the very day they were offered in the UK and can help you with all aspects of planning or finding the right size, mechanism and automation system required. Call us now or email your requirements for a professional and competitive quotation.